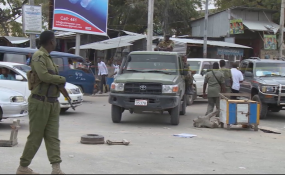 Security in Mogadishu (file photo). A witness says unidentified gunmen have shot and killed a prominent in Afgoye district in Lower Shabelle region, about 30Km northwest of Somali capital, Mogadishu on Friday night. Nuradin Abdullahi Aweys has been assassinated by pistil-wielding men near his house in El-qode nighbourhood in Afgoye, who escaped the scene before the arrival of the local security forces. Late Aweys died on the spot after he was shot in the head several times at close range as he headed to his residence, according to an eyewitness, who spoke to Radio Shabelle by phone on condition of anonymity. It's yet unclear the motive behind the murder of the elder, and the local authorities did not comment on the incident, which was the latest in string of killings targeting elders who elected the current Federal MPs. Copyright © 2017 Shabelle Media Network. All rights reserved. Distributed by AllAfrica Global Media (allAfrica.com). To contact the copyright holder directly for corrections — or for permission to republish or make other authorized use of this material, click here.